would dogs make better drivers? The image featured in this post was published in a Breitbart article, for anyone living in California, is instantly recognizable. With the cost of housing so dear, many people endure a 25 to 50-mile (one-way) commute each workday. 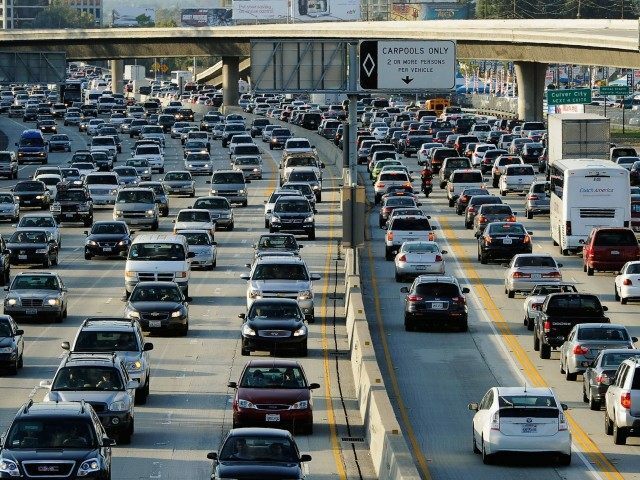 The iconic traffic snarl that is Los Angeles is not unique. With a commuting round-trip that has ranged from 90 minutes about four years ago to 3 hours today, I started thinking about bringing my dog ( only one then) to work for the calming effect these dogs have on me. An emotional-support dog might truly help everyone who endures the daily grind to work, and for those who have been working more than three decades, I think we might need some support. On any given day that I leave my driveway, I am certain that there are at least a few drivers with a mission to kill me – or suffer me bodily harm! I’m not paranoid or delusional, but with the sheer number of drivers on our roads, there are a sufficient percentage of them incompetent, incapacitated by drugs or alcohol, distracted, emotional – including impatient, angry and potentially violent. While I have seen a number of these, I have rarely seen a car with one or more dogs in it – tongues hanging out the window, peering out the back of SUVs and so forth — in a vehicle careening pell-mell down the highway tailgating me. The violent lane-changing, 80 MPH bumper -rider in rainy Thursday evening commute most likely does not have a Black Lab or St. Bernard sidekick riding shotgun. About four years ago, Dexter and I were coming back from a great day at the park, and looking forward to getting home. Sitting at a red light, I was rear-ended by a GMC truck doing 50 MPH and pushed through the intersection. Dexter was propelled into the front passenger seat. For a time, I had to be his emotional support human.